Are you considering to deploy an EHS software in your organization? Safety and regulations are crucial to any business operation, hence, these seven reasons why you should have an EHS software in place. In 2017, sanctioned fines increased up to 74% in HSE (Health and Safety Executive) according to SHP Online. This is largely due to the tough penalties for corporate incidents and health and safety offenses. Moreover, the Manufacturing Institute reports manufacturers to spend an estimated $192 billion each year for compliance with financial, security and environmental regulations in the US alone. This means an effective operational risk management system such as an EHS software is more important than ever. All business size, small- and mid-sized business to large enterprises, will benefit from having the tools and resources to properly manage safety and environment risks to people, community, production and brand value. Construction work accidents are particularly alarming given its sharp rise since 2006; other occupations paint no rosy picture either as incidents climb albeit at a much slower pace. EHS software can help arrest this trend. An EHS software is a form of data management built to help you avoid workplace incidents, maintain regulatory compliance and track incidents if they unfortunately occur. It covers a wide range of functions that mostly center on compliance and security. A comprehensive compliance registry is found in most solutions that allow segmentation according to the incident reporting dashboard, compliance task management, location, and internal audit tools. EHS software is sought after by more and more businesses to prevent incidents such as illnesses, injuries, and harmful environmental releases. This brings a rapid development in the EHS business and technological landscape. With the many solutions available today, choosing one that works for your business is not an easy task. A good place to start is by checking EHS software reviews to find the best products in the category. From here, you can learn and understand the products better and even sign up for free trials or demos, when available, to explore the software at no cost. If you are thinking whether you should use an EHS software, here are 7 reasons to help you determine if it’s important for your workflows. Worker safety is one of the top reasons why companies decide to have an EHS system in place. With employees being your most important asset, taking care of them should be a priority. Hence, you have to adhere to the safety standards outlined by regulatory bodies such as OSHA (Occupational Safety and Health Administration). The software also helps you establish a safe workplace for your employees through in-depth reporting and recording capabilities. Additionally, preventing employee injuries mean you can avoid costs from potential lawsuits, worker’s compensation, and new worker recruitment efforts. A good way to accomplish this is through leveraging collaboration. In order to achieve your organization’s EHS goals, driving engagement is crucial towards gaining foresight into ways on improving the effectiveness of your strategies. Intelex is an impressive example of an EHSQ management software that specializes in this. Through its EHSQ Alliance and integrated Intelex technologies, it features process excellence, foresight, engagement, and collaboration. 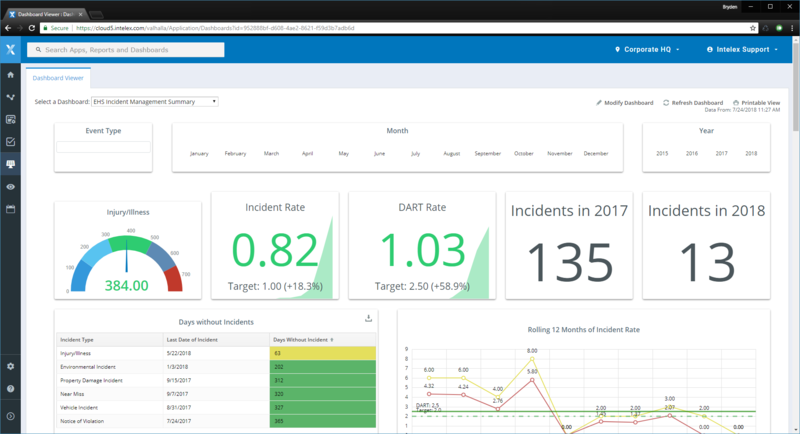 An EHS software like Intelex gives you a clear picture of your health and safety KPIs. Data is centralized, tracked and monitored in an EHS management system. It makes insights easily within your reach so you can analyze trends and ensure proactive safety measures are accomplished. These systems enable you to add important graphs and stats to your dashboard as well as to group multiple dashboards by event types or locations, among others. Seeing the bigger picture helps you stay on top of your processes. With cloud technology, your dashboards are updated in real time. As soon as an event occurs, the dashboards will update accordingly. This is important to make sure you have all the latest statistics and figures at your disposal. Each incident that occurs within the workplace is a potential finable offense. Fines are costly. Hence, you should want to avoid non-compliance when it comes to workplace regulations. The software’s function may vary based on industry to industry for regulatory compliance. For instance, in the construction industry, you will prioritize fall protection is in place for your EHS software. This means features such as equipment tracking and custom inspection checklists are prepared. Meanwhile, inventory tracking and hazmat regulations are priorities in the EHS system for the chemical industry. As with many technologies today, software deployment in mobile apps is seeing widespread adoption. In EHS, this is crucial as this gives your workers the ability to record and report incidents with speed and accuracy. Offline capability is even available to some systems to enable access to record incidents when the signal is unavailable. As per EHS Today, 32% of mid-market firms are focusing on the implementation of processes and software for incident management. However, only 28% are managing and mitigating the risk before it occurs. This shows an area for improvement as managing the incident after it occurs is more expensive compared to taking preventive measures to avoid the incident altogether. EHS software systems give your EHS managers the tool they need to improve employee safety by preventing injuries and fatalities to occur under their supervision. Why is it important to avoid negligence? In addition to the most important reason of safeguarding human life, if a worker is injured, they will have to spend time away from work while you have to continue paying them. Sustainability is vital for companies to keep in mind of. Not only will you reduce your carbon footprint, but this can help you save from energy-related costs as well. EHS software gives you clear data and actionable intelligence from that data to find ways on how your company can reduce your carbon footprint. EPA (Environmental Protection Agency) is a federal organization that administers environmental regulation and compliance to battle against climate change. Addressing EPA regulations is streamlined with the help of EHS in order to stay compliant. The system features tools for regulations for air emissions and water quality, waste management, and monitoring, and historical company performance data, among others. Insurance premiums can go up if your workplace shows it’s unsafe and workers are constantly getting injured. Insurance carriers measure the costs of civil liability damages, litigation expenses, and workers’ compensation, among others. If your claims costs are lower than similar competitors that are facing the same potential risks, you may earn a discount. When you increase workplace safety, you reduce potential insurance costs. Successful health and safety programs contribute to decreasing injury and illness costs between 20 to 40% according to the Occupational Health and Safety Administration. Insurance companies pay out fewer claims when fewer employees become ill or hurt themselves. Think of EHS software not as an operational cost but an investment that will protect your business from more costly penalties or, worse, closure order. Running a business that is especially subjected to strict regulatory environment is like forfeiting insurance; sure you get to save some money, but at what cost later?